This is the most vital decade of all history! NEVER has it been more urgently necessary to answer the question, "Does God Exist?" Atheists, scientists and historical geologists assume He does not! Churchgoers, some Christians assume He does! It's time to QUIT ASSUMING! It's time you saw the PROOF! HERE is a delusion gripping the minds of more people today than Communism! It holds them in its sway, deluding and deceiving them, making them veritable slaves! It is the concept of "no God." Recently, Sir Julian Huxley, grandson of the famed evolutionist, stated: "There is no longer either need or room for supernatural beings capable of affecting the course of events in the evolutionary pattern of thought. The earth was not created, it evolved. So did all the animals and plants that inhabit it, including our human selves, mind and soul as well as brain and body." These questions demand an answer! Your very life, the lives of your loved ones, and the future of this world hangs in the balance! I quote this statement in full for a very special reason! Let's go back and carefully ANALYZE what we have just read! Notice carefully the italicized words in the quotation you have just read. We have such words in the opening phrases as "probably; some progress has been made; attempting to explain; at least a clue; explanation commonly accepted; Hypothesis ; and it suggests." What a collection! Here are numerous "attempts" to explain, "some progress" being made, at least a "clue," and the "suggestion" of an "hypothesis" — the very word itself meaning "WE GUESS"! Then, in very careful wording, having begun with a number of "possibles" and "perhapses" the book begins to tell of definite PAST OCCURRENCES which are said to have taken place! But let's analyze further. Lee's get to the very trunk of the tree of this very vital FIRST PROOF of the existence of God! In the very BEGINNING the writers, even though beginning with many attempts to explain, clues and guesses, admit the existence of our solar system, a "sun," another "huge star," the "operation of the law of gravitation," great "masses of flaming gas," and admit that these gases "gradually cooled!" They also mention how these gases "crystallized" and then continued to "revolve around the sun, held in their orbits by the gravitational pull of the parent body!" What a fantastic array! Here is a tremendous, limitless, imagination-defying expanse — an entire universe! Here is a whole solar system, a huge sun, the operation of certain, definite, immutable, unchangeable LAWS! Here is a supposed collision between gigantic, breathtakingly huge astral bodies, resulting in the supposed formulation of our present solar system! Think of it! All of these myriad laws, of heat, light, energy, motion, the rotation of astral bodies, the laws of gravity, the principle of isostasy, which demands that every orbital body must gradually assume and maintain a near — round shape, and myriad other laws are admitted to exist which are entirely too numerous to mention! Get back to the real TRUNK of the tree! Where is the place to begin? Is it an attempt to explain the existence of our present solar system? Decidedly not! Scientists and astronomers tell us that our solar system is only one of many such systems in our great galaxy called the "Milky Way." However, even our galaxy is only one of myriad galaxies, which form only a part of the vast, limitless expanse of the universe. Our planet, astronomers assure us, is merely a third-rate planet in a second-rate solar system, lost in the expanses of seemingly limitless space! Yes, there it is. In dissecting and looking carefully into the statements of some of the preposterous hypotheses which have been advanced, you begin to see that in every case the writers have begun with an orderly LAW-ABIDING universe, governed by irrefutable LAWS! The existence of LAW, unchangeable, immutable, irrevocable, unseen and yet active, absolutely DEMANDS the existence of a GREAT LAWGIVER! "There is one LAWGIVER who is able to save and to destroy..." (James 4:12). The process of development of music from simple to complex is, in a sense, an "evolutionary" process. This, as is true in all technological inventions, has perhaps led many to assume such a development is also true in organic living material! Notice it! Evolution theorizes from the beginning of organic life — already having LIFE with which to begin! It does not now show, nor has it ever shown, nor will it ever be able to show how life CAME into existence! The theory of evolution (the word "theory" means "we think") states simply, that all life forms that we know today, including humankind, all plant and animal life in all of its myriad species, have gradually evolved from the most simple life forms to the complex, intricate, interdependent species we see about us today, each having its own peculiar cyclical life character, each producing according to its own kind. Evolution states that this life evolved in a "gradual process," by "resident forces " into the complexity of life today. Evolutionists, geneticists, biologists, scientists in any field whatsoever have never been able to demonstrate, nor to offer the slightest evidence that the LIVING can come into existence from the not living! It is true that certain laboratory experiments have taken place in which supposed "dead cells" are said to have been "revived" and brought back to life by the means of certain chemical compounds! This, however, is a far cry from "spontaneous generation." There is a broad, gaping, yawning chasm of separation between life and death. The great gap between the not-living and the living is so broad, so insurmountable, so unfathomable by man, that evolutionists can only "suppose" and guess, offering vague, etherial, nebulous "theories" as to how life "might have" begun! However, on the other hand, there is an absolute demonstrable law of science which comprises the second major proof of the existence of a life-giving God! "Bio" means life! "Genesis" means beginning. This law, then, is a law concerning the BEGINNING of life! This law, simply stated, is the absolute law that life comes only from life. That the not-living can never give rise to, give birth to or produce the living. The very existence of LIFE demands a LIFE-GIVER! God states dogmatically, "And the Eternal God formed man of the dust of the ground and breathed into his nostrils the breath of life, and man became a living soul" (Gen. 2 :7). Almighty God, the life Self-Existent, the One who has life, who IS life, who was before all things, IMPARTED life to the first man, and set within man, the animals, and all plants, the cyclical character of life which enables them to reproduce according to certain set laws! GOD IS THE GREAT LIFE-GIVER! You will notice that evolutionists, in trying to substantiate their theory, always BEGIN with an orderly universe, and the existence of matter. Notice the so-called Theory of Evolution BEGINS with matter, laws, and "simple" life! Until recently, scientists talked of the law of the "conservation of matter." However, with the discoveries in nuclear physics, and following Madame Curie's experiments with radium, scientists have now found there is a certain amount of "disintegration" in matter! This deterioration of matter is a scientific fact! Uranium (U 238) gradually disintegrates through many intermediate stages into lead (Pb 206). Uranium, as you may well know, is radioactive and gives off energy in the form of radiation. Gradually, over a period of seemingly limitless years, this radioactive material disintegrates into lead! There is no new uranium coming into existence today! This means, simply stated, that science has proved that this earth is gradually running down! The earth, and the whole universe, is like a great, giant clock, which at one time was wound up! It has been gradually "running down" ever since, and is not now by any process known or observed or measured being "wound up" again! It is as if man has arrived on the scene in the midst of an orderly universe which is gradually "running down"! Observe even the fields, mountains, valleys, and various topographical features about you! Years ago, a man named John Powell, an early American explorer and geologist, observed the process of erosion from various streams and rivers, and was led to the conclusion that, given enough time, streams would wear down any land surface, no matter how high it had been originally, to what he called the grand base level fixed by the level of the ocean surface. This process of erosion is seen about you constantly. That is, that the higher and the steeper the mountains, the more rapid is the erosion, and gradually all high areas of the earth are being lowered. The sea bottoms, river valleys and low areas are gradually becoming higher, so that eventually, given enough time, the earth would, should this process continue, become smoother and smoother. This, while a totally different consideration from the disintegration of uranium, nevertheless serves to show the gradual "running down" of the earth. Science has firmly established, then, there has been no past eternity of matter! Matter must have at one time COME INTO EXISTENCE! Since matter by its very nature has had no past eternity, it had to have been, at one time, brought into existence! Creation, then, the very existence of things, absolutely demands and requires a Creator! That which is made requires a Maker! That which is produced requires a Producer! Matter, it has been firmly established, has been made — it did not just "happen" and has had no past eternity! Therefore, the third great proof is that the creation requires a great Creator! The One who is quoted in the first person as being God said, "Let the earth bring forth the living creature after his kind, cattle, and creeping thing, and beast of the earth after his kind: and it was so. And God made the beast of the earth after his kind, and cattle after their kind, and everything that creepeth upon the earth after his kind: and God saw that it was good" (Gen. 1:24-25). Scientists have attempted to show the evolutionary pattern by "comparative embryology"; by a study of selective breeding, genetics, and various other aspects of biology. There are hundreds of different varieties within a certain species, and while there may be small, tiny dogs, such as the Mexican Chihuahua, and also great huge dogs such as the St. Bernard or the Great Dane, they are still dogs! They are not cats, nor horses, nor are they even beginning to show a gradual trend toward developing into another species! They are all of the same kind. Comparative Embryology tries to point out that the beginning embryos of fish, polywogs, and humans look very much alike. This is absolutely true! But it proves absolutely nothing for the case of evolution, but does offer a STRONGER proof of the existence of God! Scientists are defied to attempt to make the embryo of a fish turn out to be a polliwog, a man, or anything other than a fish from the exact same kind of fish which lay the egg in the first place! These do not prove evolution! They prove, rather, the existence of absolute unchangeable LAWS governing the reproduction of all animal and plant life, and that those laws function within certain limited bounds that cannot be transcended or broken! While we are able to breed and cultivate today new varieties within a great kind, they are still of the same KIND and not a new species of life! They are able to tell in advance just exactly what the offspring are going to look like! Again, this does not prove anything except demonstrate the existence of an all-wise, all-powerful God who made these laws, and who also sustains them! The fact God said let the earth bring forth "after his kind," and has been enforcing and sustaining that law ever since is the fourth major proof of the existence of God! In attempting to array the skeletons of an orangutan, chimpanzee, ape, gorilla, and a man, evolutionists assure us there is a definite pattern showing all have come from one common ancestor! This is an absolute fallacy! And again, this merely serves to show another clear proof of God! It does not prove an evolutionary process, but it does prove, rather, if men were willing to look at the FACTS, similarity of DESIGN! It shows that the same "Architect" had the same general plan and design in mind! It shows functional similarity, NOT the evolution of one to the other. This absolutely proves, not only the existence of a Lawgiver, but that there is, alive, acting RIGHT NOW, a Great Sustainer of all that is! These laws are upheld, sustained, KEPT in action! How? By the Sustainer, who is GOD! Look about you! You live in a highly complex, intricate and interdependent world! You have never seen an ugly sunset! You have never seen an ugly scene in the desert, in the mountains, at sea, or anywhere on the surface of this entire earth, unless it was a scene made ugly by man! All is in harmony. The question to the evolutionist is: Which "evolved" first, the corn or the bee? Did the bee evolve slowly for thousands, millions or billions of years independent of the corn stalks, the flowers and the pollens from growing things which are his life source? Did the flowers, grasses, trees, and grains all "evolve" slowly and gradually over a period of millions or billions of years independent of the little bee, upon whom they must rely for their very continuation of life? These are totally insurmountable, and unanswerable questions to the evolutionists! The old question, "Which came first, the chicken or the egg?" is a question which the evolutionist feels worthy only of disdain. Why? Simply because he cannot answer it! It is better from his point of view, to merely scoff, make fun of and attempt to dismiss such a question when he cannot answer it! This total interdependency of all life forms — the tremendous design within this universe shows a common Beginner, one main Architect, one great Designer with an overall framework of a plan of creation into which all life forms fit. Nothing lives or dies to itself. Each living thing, whether plant or animal, when it dies, supplies further life for other living things. Observe a forest. A tree grows, finally dies and falls, only to become part of the fallow forest floor, supplying life-giving elements for the young trees around which it had sown in its lifetime! This great universe, and the complex, intricate earth on which you live and draw breath, is a world of great design. It is a world of such complex and intricate design so as to take the very breath in beginning to investigate even the minutest part. The cleavage properties of minerals, the wings of a bird or a fly, the beauty of a sunset, the facets of a quartz crystal, and above all, the marvelous, tremendous masterpiece of all design, the human body, all point out that for such intricate design, THERE HAD TO BE AN ETERNAL DESIGNER! 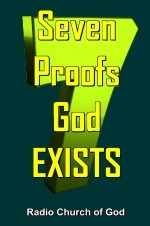 This sixth proof of the existence of an Almighty God is perhaps the most astounding of all! About one full third of your Bible is prophecy — and while most of that one-third pertains to our present day, there are many, many prophecies which have already been fulfilled, and which are presently BEING fulfilled! God sent His prophets hundreds of years ago to such major cities as Babylon, Ekron, Ashdod, Askelon, Tyre and Sidon. These prophets — simple human beings who had been commissioned with a message — foretold the decay, fall and particular type of fate which was to befall each of these ancient cities! Since we have the technical details of the fulfillment of many of these prophecies in booklet form and in order to save space, I invite you to write for Mr. Armstrong's free booklet, "The PROOF of the Bible!" This attractively printed booklet will give you the particular fulfillments of these many prophecies. It will show you by pictures exactly how these prophecies were fulfilled. You will see with your own eyes, how the prophecies of God have come to pass exactly as He said! This last proof is perhaps the greatest proof of all to Christians. It is the proof of answered prayer! However, since the skeptics, atheists and doubters have never prayed, and hence have never had prayers answered, they continue to DOUBT! Or take George Mueller's example. George Mueller is dead now, but he probably was the greatest modern apostle of FAITH. He founded five great orphanages and other charitable institutions in Bristol, England. He started out, as FAITH always does, with a very small work, without any financial backing, and absolutely no means of support, except to get down on knees and send up a believing prayer to God. Altogether he received more than a million four hundred thousand POUNDS — that was about SEVEN MILLIONS DOLLARS — that was sent to him in answer to his prayers! Real answered prayer is NOT the mere "working out of events" as a result of "concentration." Many people today seem to assume prayer is merely an accomplishment as a result of "positive thinking" or a psychological adjustment! This is a gross error! Real answered prayer is a direct, divine, supernatural INTERVENTION, a completely MIRACULOUS intervention and direct answer from Almighty God! It is the result of being obedient to God's laws, asking according to His will, and then BELIEVING, in faith until the answer comes! These seven, irrefutable, unchallengeable PROOFS of the existence of Almighty God represent only the minutest beginning of the subject! They are, nevertheless, proofs! It's about time people quit assuming — it's about time they begin to really PROVE all things! It's about time YOU should say, with Job, "For I KNOW that MY REDEEMER LIVETH, and that he shall stand at the latter day upon the earth" (Job 19:25).